PREMIO MEJOR COMUNICACIÓN PÓSTER PRESENTADA EN EL 9º CONGRESO DE LA SOCIEDAD ESPAÑOLA DE CONTRACEPCIÓN. 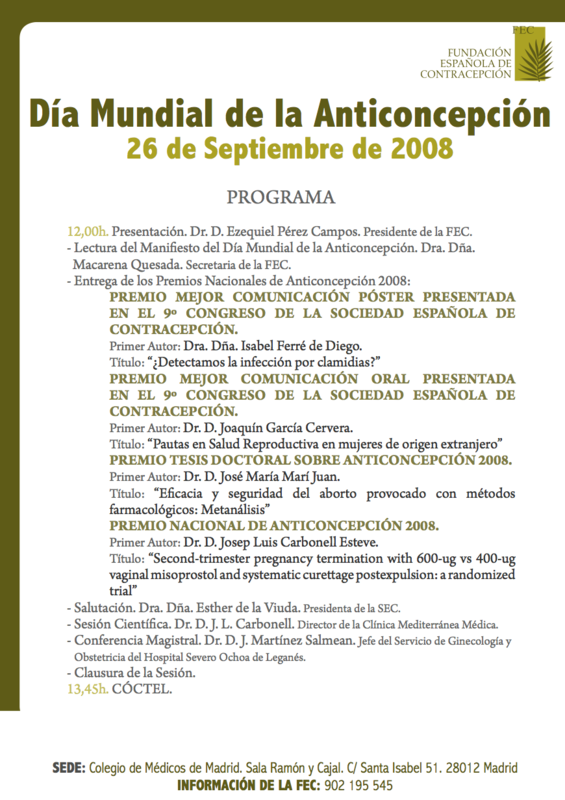 PREMIO MEJOR TESIS DOCTORAL SOBRE ANTICONCEPCIÓN 2008. PREMIO MEJOR COMUNICACIÓN ORAL PRESENTADA EN EL 9º CONGRESO DE LA SOCIEDAD ESPAÑOLA DE CONTRACEPCIÓN. PREMIO NACIONAL DE ANTICONCEPCIÓN 2008. Primer Autor: Dr. D. Josep Luis Carbonell Esteve. Título: “Second-trimester pregnancy termination with 600-ug vs 400-ug vaginal misoprostol and systematic curettage postexpulsion: a randomized trial” .